The After-Schools programme was set up to facilitate the needs of young people living in Ballyfermot who may not have the ability or support to complete their homework after school. Over the duration of the school year, the After-Schools programme runs for four days each week in our Decies centre and Gurteen Youth Centre. The young people are encouraged to attend by the youth work team who contact the primary schools at the start of every academic year. 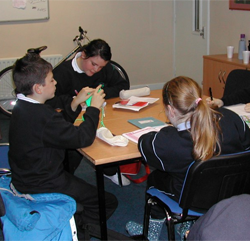 Ballyfermot Youth Service provides shelter, hot meals, stationary equipment and activities to encourage homework for the youth in the community. The After-Schools programme also serves as a link to encourage young people to stay involved in the youth service. The school transfer programme has been devised and organised by Ballyfermot Youth Service and the Home School Liaison Co-ordinators in St.Dominic’s and Caritas secondary schools. The programme is run in conjunction with the H.S.L co-ordinators and aims to make the transition from primary school to secondary school as easy as possible for the young person.The programme also helps to identify young people that may need additional support during their secondary years, this can then be provided by the youth service by involving them in specific targeted work. – Prepare the students for the challenges they will experience in the transfer from primary to secondary school. – Mingle and mix so that students from different classes and schools get to work together. – Ease the transition process to ensure that students are happy in First Year & make progress with their studies. BYS see music as a great way for young people to express themselves, understand different cultures, develop confidence and skills, make friends and most importantly enjoy themselves. Our aim is to make these groups as relevant to the participants as possible and encourage them to explore both new music and old. 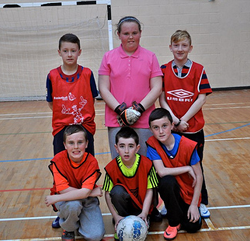 Therefore we offer a range of beginner and intermediate groups to meet the needs of the young people of Ballyfermot. As part of our summer project we also run a music camp where our young people who have taken part during the year can attend a residential in ‘Oakwood’. At Oakwood, young people can learn about the process of recording, setting up the equipment and recording songs. 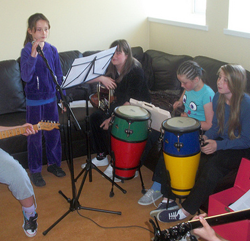 Our groups can incorporate guitar, drumming, DJ’ing, song writing, rap and singing. The Ballyfermot Youth Service run a free 6-week smoking prevention programme in schools, youth groups and clubs in the area. The Quit for life programme was developed by the HSE and our staff are trained to deliver this programme .the programme can be delivered over six weeks or a 2 full days, which ever meets the groups needs. The programme is workshop based and very interactive so as to challange the young person. We have delivered this programme to various age groups both male and female , the programme session is about one hour in length. The first session is a information session. The session is about the content of the programme. To give a overview off what a smoking cessation group entails, outline effects of smoking, outline benefits of quitting, nutrition advice, stress management, advice on different smoking cessation methods and physical activity advice. – What is Child Abuse? – Guide-lines on good practice for youth workers. Ballyfermot Youth Service is dedicated to supporting quality education in local schools and communities, with a mentoring Programmes in the area. The Mentoring Programme works in partnership with Secondary schools in the community as well as the local community and Youth Groups. At this time of economic uncertainty, those from disadvantaged communities face an increased risk of being left behind by the education system. There is a need for extra educational support, to ensure that those at a disadvantage are supported to get maximum benefit from the education system. The Ballyfermot Youth Service Mentoring Programme offers support to people at the margins of the education system. 1. To address educational disadvantage and promote social inclusion in Ireland. The Mentoring Programme works in partnership with the community organisations and schools as well as youth and community groups. In the 11/12 academic year, 300 people from Ballyfermot / Cherry Orchard benefited from Mentoring Projects supported by volunteers. Who benefits from the Mentoring Programme? The programme works with three groups: Children from designated disadvantaged schools, 4th year transition students, Primary school children. 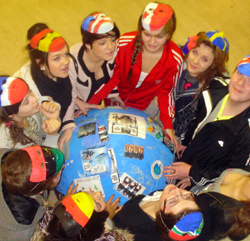 One World Week is a Development Education programme that is co-ordinated by the National Youth Council in Ireland . Each year, “The Week” is an opportunity for young people from diverse backgrounds to come together to learn about global justice, to spread that learning and to use it to take action for justice locally and globally. A different theme for each year is chosen and youth organisations are encouraged to actively take part in the week. BYS sees this week as a very important tool for empowering our young people. Each year we encourage our groups to take part in one world week. We use various activities such as dance, music and arts to tackle the issues. BYS participants build up to OOW with a 10 week programme holding workshops and activities that help the young people from our service understand about issues locally and globally. The event plays host to lots of young people from all over Ireland and other cultures. The One world week helps our young people build relationships and have a better understanding of the world at the end of one world week. The Saturday night soccer camp caters for up to 100 young people every Saturday evening and is run from five pm to 10 pm. The camp is held in Ballyfermot Sports Complex which is adjacent to Gurteen Youth Centre and runs from October to May each year. The event is split into different age groups with some of the young people acting as referees at the event for their peers. The youth centre is also open at this time and refreshments and music is allways on offer. The event is thoroughly enjoyed by all participants and a full house each week. This initiative continues to be a success throughout the entire year. Bullying is a serious issue facing young people and society. BYS believe that we must equip young people with the tools to challenge bullying….Give them the skills and the mandate to deal with some forms of conflict themselves. Put in place peer mediation or mentoring programmes. Many bullying incidents escalate out of small scale arguments/misunderstandings, if young people have the skills and the confidence to deal with them themselves, many bullying incidents could be prevented. Our youth work team offer group work and team dynamics in challenging bullying, this is done using various methods, role play, art, workshops, discussions. For more information contact our youth work team. 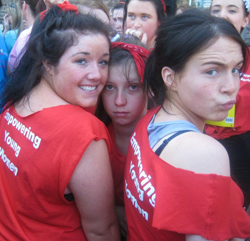 Ballyfermot Youth Service engages with young females, providing them with specific empowering opportunities to enhance their personal development, through a number of different programmes like Drug Awareness, Equality and Empowerment, Holistic, Sexual Health, Beauty therapy, and Critical Social Awareness. These programmes help young women in the Ballyfermot area to be more positive, confident, and more aware of the inequalities that affects them as young women. We aim to build solidarity amongst young women, which will give them a more powerful voice, help them make good informed decisions, and be in control within difficult and challenging situations. It also gives young females self-strength, self-power, self-reliance, the opportunity to make their own choices and be involved in decision making. It gives young female participants the opportunity to explore different situations in the sense of being able to influence what happens to them and their peers. These young women are learning about power, empowerment, disempowerment, and being able to recognise power structures within their lives, communities and society. This group meets every Thursday from 4 pm – 5.30pm at Gurteen Youth Club.